The late John McCabe, attending the first performance of The Aspern Papers at the Port Fairy Spring Festival in Australia in 1995, described the work as “a thoughtful and rather moving exposition of a human situation that was unusual in operatic terms but nonetheless engrossing … I felt it was a sincere and deeply-felt response to the subject matter and deserved to be heard again.” Unfortunately, and as so often in the novelty-obsessed operatic world, his recommendation fell on deaf ears and after two further performances in Melbourne the same year the opera was never revived until this recording five years after the composer’s death. Although it is described as a chamber opera, it does not appear to fall into the usual definition of such a work as employing a small orchestra with single winds and strings. Instead we hear double woodwind and horns, timpani, percussion, harp and a massed body of strings – almost indeed the same scoring as many full-scale operas of the classical late eighteenth century. The Night of the Wedding, on the other hand, goes to the other extreme, employing only a piano accompaniment which is presumably intended to be played behind the scenes since the same instrumentalist is asked to switch to harpsichord backstage at a couple of points. I met Michael Hurd once in the early 1980s and corresponded with him over a number of years, largely on the basis of his expressed admiration of my own chamber opera The Dialogues of Oisin and Saint Patric. That is not to say that we did not have substantial disagreements over each other’s music. He positively bridled at some of my choices of texts for musical setting, and I in my turn levelled heavy criticism at his series of popular cantatas for schools such as Jonah-Man Jazz, which seemed to me at the time to be catering for the lowest common denominator of children’s musical appetites; and hearing these works again in recorded performances on Naxos has added to that initial dislike a feeling that the works themselves have dated irretrievably. The Aspern Papers, the composer’s most substantial operatic score, is something very different – a work of real emotional feeling and beauty which really does deserve the revival that John McCabe suggested. The libretto derives both from the Henry James novella and a 1959 staged version, but the text was shaped by Hurd himself with a view to operatic setting. The plot may be very briefly summarised as the results of the attempts of a biographer to persuade the poet Jeffrey Aspern’s former lover Juliana Bordereau to give him access to her hoard of correspondence, and the disastrous results that follow his attempt to seduce Miss Tina to persuade her to that end. Hurd, himself a trenchant and not uncritical biographer of such figures as Rutland Boughton and Ivor Gurney, clearly found a degree of identity with the equivocal character of the would-be biographer Harry Jordan, and he provides music of real sympathy for all the characters who hide their real feelings beneath a veneer of politeness and good manners. John McCabe described the music as “fairly conservative, reminiscent perhaps of Poulenc in his sentiment-filled mood, but none the worse for that.” I found rather more than that. From the very opening, with the theme later to be associated with the Aspern papers themselves, the music breathes an atmosphere of decaying splendour and wistful reminiscence which exactly fits the Venetian milieu of the story. Hurd displays throughout a marvellous sense of identity with the words, not always set in a predictable manner but always with a clear understanding for the way in which the texts will fall upon the voice of the singer and the ear of the listener. There are places, too, where he allows the music to expand from the generally arioso tone into a warmer and richer style without ever allowing the purely tonal considerations to overweigh the sense of the text and the action. The first of these comes with Jordan’s encomium to the genius of Aspern during the opening scene, and in the end of the second scene the duet between Jordan and Tina develops a romantic undertone that highlights the increasing emotional connection between them. Even more impressive is the second scene of Act Two, a soliloquy for Juliana in which she recalls her life with Aspern ending in a setting of Byron’s “We’ll go no more a-roving” which packs a real emotional punch. The music never overflows its bounds, always restrained within the conventions of polite society but there is an electric undertow which goes far beyond the “sentimentality” that McCabe detected. The end, where Tina tells Jordan that she has burnt the papers and, finding that his affection for her was largely motivated by his desire to get his hands on them, proceeds to destroy them after he has left, is gently drawn out in a sad orchestral peroration which rises way above the purely melodramatic. The same subject was tackled by Dominick Argento in an opera three years later for Dallas, with an expanded and star-studded cast; but this made substantial alterations to the original James story which does not allow the two treatments to be strictly comparable. Argento’s much more melodramatic and in places expressionist score makes use of a substantial romantic orchestra, but there are places where Hurd’s smaller-scale scores points over its more opulent rival. The singers seem to appreciate this, making sure that every word is clear - and incidentally demonstrating a number of discrepancies between what they sing and the printed libretto provided. Owen Gilhooly manages to make the unscrupulous Harry Jordan into a believable and indeed sympathetic character, Louise Winter makes Juliana into more than just an old woman obsessed with memories of her past, and Pippa Goss makes much of little as the catalyst who brings the other characters together. Clare McCaldin is warm and tender as Tina, but her adoption of a deliberately lower-class voice as the Servant is rather overdone and detracts from her delivery of her folksong in the final scene where the two roles she is playing actually converse with each other. The orchestra play with delicacy – and with body when required – and George Vass paces the score admirably. There are errors in the printed libretto. These may represent amendments made during the course of performance, since they are generally improvements. That said, the set is marvellously presented with two booklets: one containing notes by Paul Conway and Michael Dendle along with performer biographies, and the other containing the complete texts of both operas. I have left the much less substantial The Night of the Wedding to the end, simply because by the side of The Aspern Papers it is so much a less substantial score: indeed little more than a jeu d’esprit in which none of the characters elicit much in the way of sympathy. A marquise, fleeing an unwanted marriage, takes refuge with a count; the latter challenges the pursuing husband to a duel, during which the marquise is supposedly shot; once the two protagonists are out of the way, she then rings the bell for the count’s good-looking servant to come to rather more than just her aid. The text, again by the composer, is based on the play Nuit de Noces by Frederick Witney. It is amazing to discover that this was written as late as 1945, since the whole atmosphere breathes the same air as George Bernard Shaw’s brief farces written in the period just before the First World War. Hurd manages to spice up the action with a series of rhymed couplets which are bound together by the piano into extended numbers but one is left to wonder at what attracted him to a plot of such inherent silliness in the first place. Matthew Buswell sounds rather hoarse in places as the deserted husband, but his voice is well distinguished from the lighter-toned Nicholas Morton; Rhian Lois is fine as the fleeing spouse, but her final line sounds catty rather than spirited; and somehow it seems typical that Garry Humphreys as the manservant — who after all gets the girl in the end — is given only three lines to sing only one of which is more than three syllables long. Never mind, given the quality of the main work on this set it is easy to disregard this score as an inconsiderable trifle. It hardly seems to need a conductor at all, but Ronald Corp keeps the music on the move and manages to obtain some nicely inflected accents. One further thing. 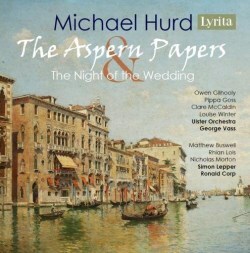 Without seeing the opera staged, it nonetheless seems to me that Hurd’s timing in The Aspern Papers is impeccable. He allows just enough time for the stage directions to be carried out, never extending these to display the virtues of his orchestral writing but at the same time never cutting short the meditation over final tableaux in the manner that seems to elude so many modern composers. In short, The Aspern Papers seems to me to be a masterpiece which richly deserves revival: not only Hurd’s longest work for the stage, but also his finest. It would not stretch the resources of adventurous amateur operatic societies – and Hurd was a great believer in writing for the talents of amateurs. At the same time we must be eternally grateful, yet again, to Lyrita for allowing us to hear a score that could all too easily have been allowed to rust away in obscurity. The Aspern Papers ... a masterpiece that richly deserves revival: not only Hurd’s longest stage work but also his finest.